The First Monday in May is a 2016 documentary film directed by Andrew Rossi. The film follows the creation of the Metropolitan Museum of Art's most attended fashion exhibit in history: the 2015 art exhibition China: Through the Looking Glass by curator Andrew Bolton at New York's Metropolitan Museum of Art. It was produced by Fabiola Beracasa Beckman, Dawn Ostroff and Sylvana Ward Durrett and distributed by Magnolia Pictures. The documentary was first released on April 13, 2016 as the opening film of the 2016 Tribeca Film Festival. The First Monday in May chronicles a year's worth of preparations for the Chinese-inspired fashion exhibit China: Through the Looking Glass and the gala which accompanied the exhibit. The exhibit featured 150 garments from 40 designers. Andrew Bolton, the chief curator at the Costume Institute, conceptualizes and designs the Metropolitan Museum of Art Gala with Anna Wintour. The Met Gala, the Costume Institute's annual event, is a multimillion-dollar fundraiser. The film also depicts Wintour's daily life and questions fashion as art. As of 2016, China: Through the Looking Glass is the most visited exhibit in the Costume Institute's history and one of the most visited exhibitions in the entire history of the Metropolitan Museum of Art. ^ a b c d Jocelyn Noveck (April 25, 2016). "Met curator Andrew Bolton, quiet defender of fashion as art". The State. Retrieved April 29, 2016. ^ a b c John Powers (April 13, 2016). "Andrew Rossi's Documentary About the Met Gala, The First Monday in May, Premiers Tonight at the Tribeca Film Festival". Vogue. Retrieved April 29, 2016. ^ a b Patricia Garcia (February 22, 2016). "First Monday in May: Watch the Trailer for the New Met Gala Documentary". Vogue. Retrieved April 29, 2016. ^ Noel Murray (April 14, 2016). "'The First Monday in May' gets lost in the Met amid several story lines". Los Angeles Times. Retrieved April 29, 2016. ^ a b Cox, Gordon (22 February 2016). "Tribeca Film Festival to Open With Met Museum Documentary 'The First Monday in May'". Variety. Retrieved 22 February 2016. ^ Murphy, Mekado (22 February 2016). "Tribeca Film Festival Opening With Look at Met's Costume Show". New York Times. Retrieved 22 February 2016. ^ Brian Brooks (April 16, 2016). "Andrew Rossi's 'The First Monday In May' Provides Access To Exclusive Bash - Tribeca Studio". Deadline. Retrieved April 29, 2016. ^ a b Chantal Fernandez (April 14, 2016). "Andrew Bolton is the Heart of 'The First Monday in May' Met Gala Documentary". Fashionista. Retrieved April 29, 2016. ^ Katie Van Syckle (April 14, 2016). 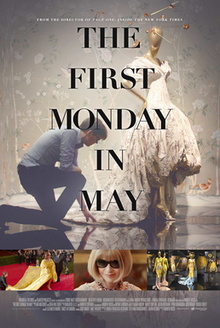 "Tribeca Kicks Off With Anna Wintour Met Gala Documentary 'The First Monday in May'". Variety. Retrieved April 29, 2016. ^ Frank Scheck (April 13, 2016). "'The First Monday in May': Tribeca Review". The Hollywood Reporter. Retrieved April 29, 2016. This page was last edited on 1 July 2018, at 12:18 (UTC).